This is an update on the construction status of Central Park 2 in Sohna Road Gurgaon as on Feb 2013. For Tower 1 to 9, although approx 300 families are living in the complex, there has been no progress in completion of common facilites. 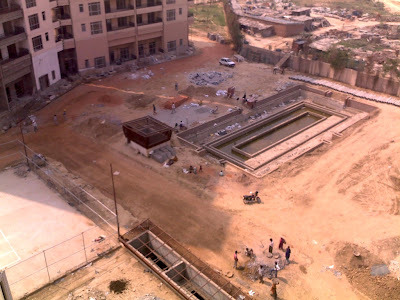 The builder has not created the club, nursery school, creche, EWS quarters, Primary school etc which fall in the Tower 1 to 9 area. The multipurpose halls on rooftops of Tower 3 & 4 were also not handed over to RWA. The roads in the area were completely damaged by the builders trucks, yet no repairs have been done to them so far. 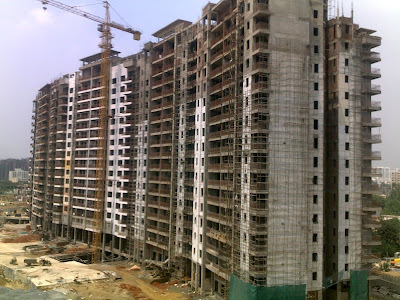 There is water leakages in all basements and seepage in due to poor quality of construction in most apartments. 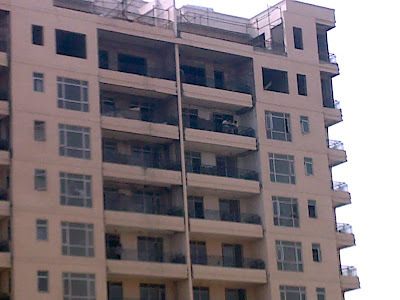 Overall ,the condominium is in a sorry state of affairs and the residents are completely dejected. Image in Feb 2013. See the previous post of Sept 2012 - almost same. For Towers 10 to 19, it seems like the possession of all these 9 towers will be given together - maybe in a year time. It's very difficult to predict when these towers will be completed - because the exterior hasn't seen much changes in the past 1 year and the interiors are fully done up - which takes a lot of time. The best prediction could be March 2014 before anyone could live here, if it happens before that, great! Towers 10-12 have seen some progress but Tower 17 - 19 have a lot of work pending in them. A fence is being created to prevent Tower 10-19 residents from accessing the construction area. The central garden is partially dug up because of the foundation work of the central two towers. The location of the foundation suggests the towers are not being created as per previous plans or as per what was shown in initial brochures etc - which is sure to attract some litigation. These towers will take at least 3 to 4 years, based on past records, to be completed. 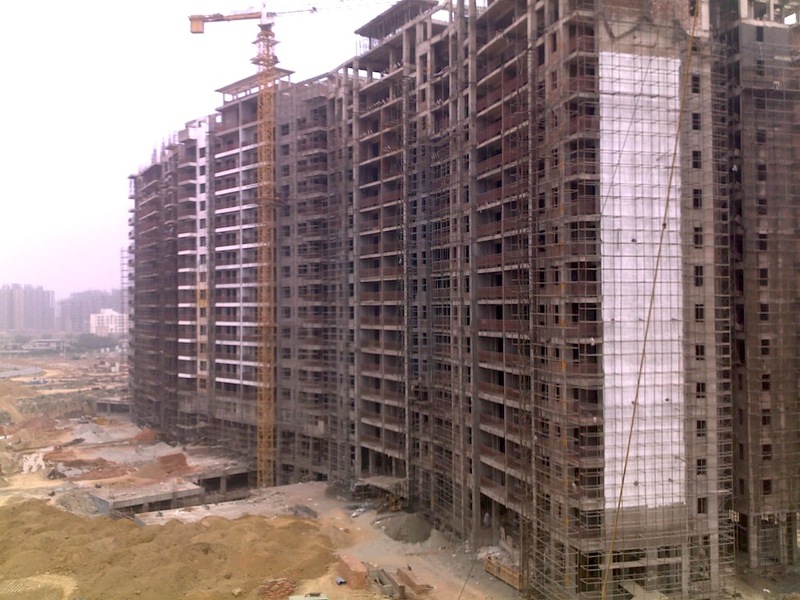 For Towers 20 to 26, the structure work is in progress and the structure should be ready within 2013. It might be somewhere in 2015 by when these towers could see some sort of completion, provided everything remains stable, including the economy, legal status of the project etc. This is what the whole site of Central Park 2 looks like in Feb 2013 - 8 and half years after it was launched. 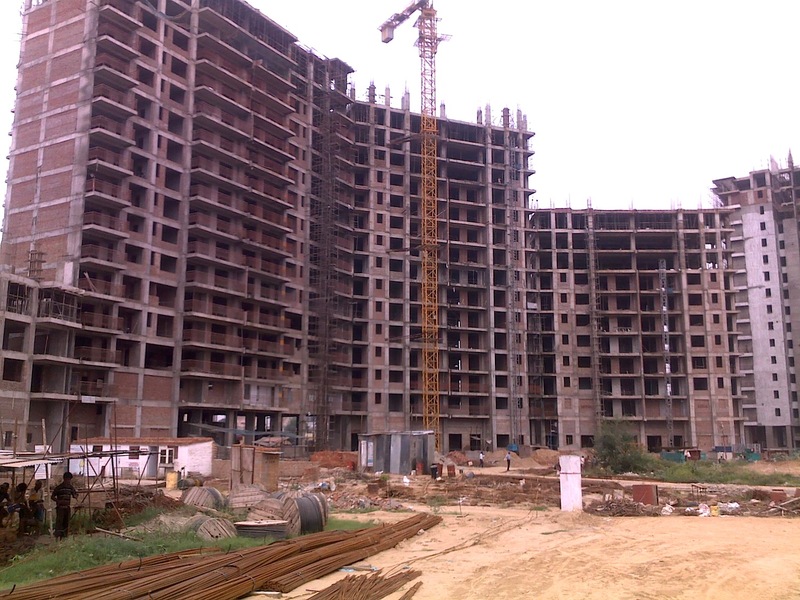 Due to the random layout changes made by builder and other issues, the Residents Association has gone to court, wherein the court has instructed the Govt agencies involved to resolve all the issues within 3 months time. You can see in the updated map that layout of all Tower 20 to 26 have been changed and now the layout of central two towers also seems changed. Overall, it looks like the entire project might get completed by 2018. Till that time, all residents will have to live amidst the construction dust during the day, noise & lights at night, besides the issue of poor security. During this time too, residents will have to suffer the abysmal quality of construction including faculty lifts, broken roads,water leakage in basements, lack of proper management of affairs etc. Did someone say "The Exclusive Resort that is your home?" Welcome! This is an update on the construction status of Central Park 2 in Sohna Road Gurgaon as on Sept 2012. 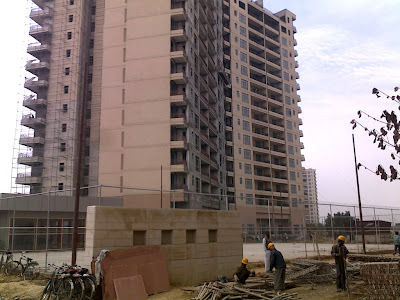 For tower 1 to 9, while structure work has been completed and residents have started living (over 200 families so far), a lot of construction is still pending. 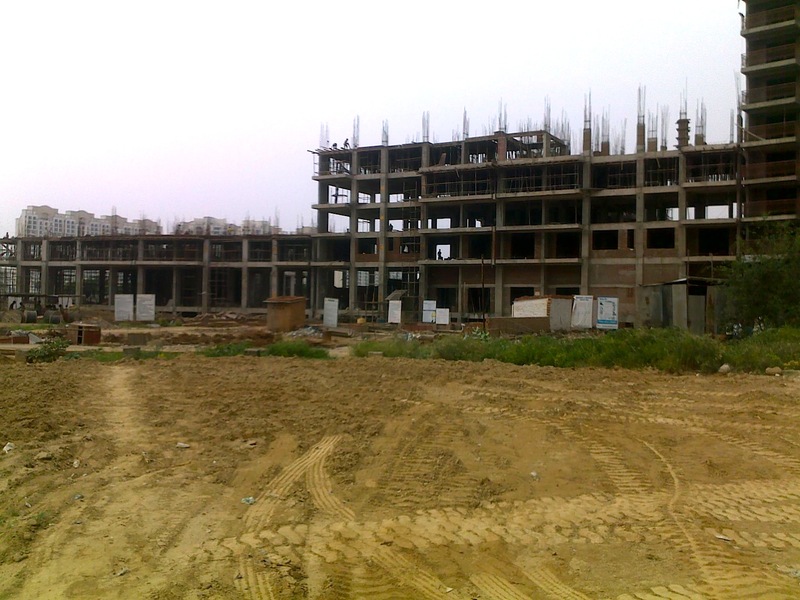 The clubhouse, nursery school, EWS quarters, creche etc are all pending - only the work on clubhouse was going on. For about the past 1 month, all construction work has stopped because of some Court Order preventing use of bore-well water etc. 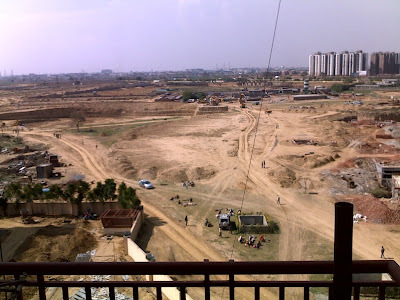 Even the work on clubhouse of Tower 1 to 9 has been stopped along with work of Tower 10 to 26, we believe a lot of construction sites in Gurgaon are facing similar issues. For towers 10, 11, 12 & 14, the final finishing work is on. 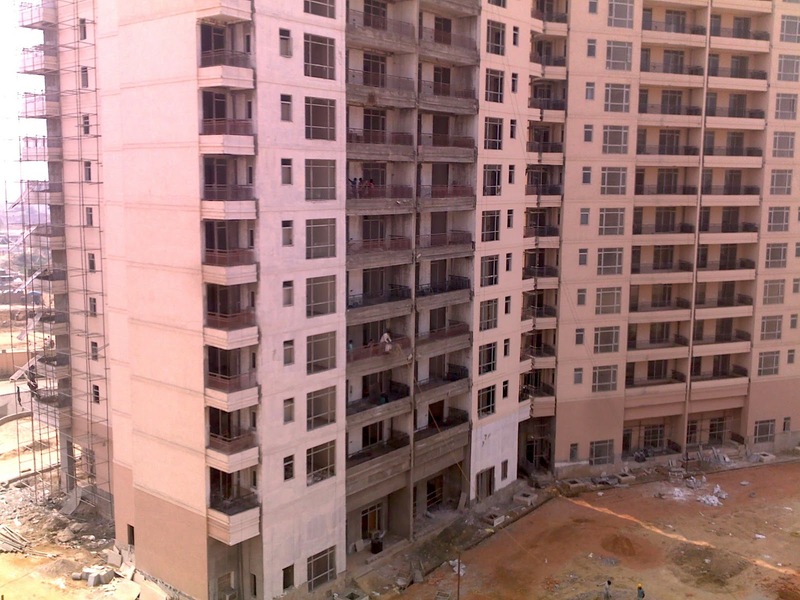 The interior work is being done but our estimate is that no one will be able to move into these towers before July 2013. For towers 15 to 19, the status is even worse, it might take over 1.5 years to complete them as structure work is still going on. The status of Tower 20 to 26 is show below. Lets assume 2.5 years before anyone moves into them. That would be somewhere around March 2015. 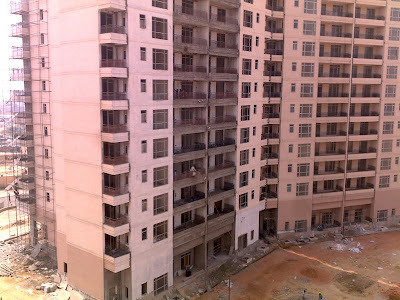 The plot for 2 Bel Air Towers is just lying vacant as seen here, these towers have not yet been launched at it's impossible to give any kind of estimate on when they would be ready until the work starts. 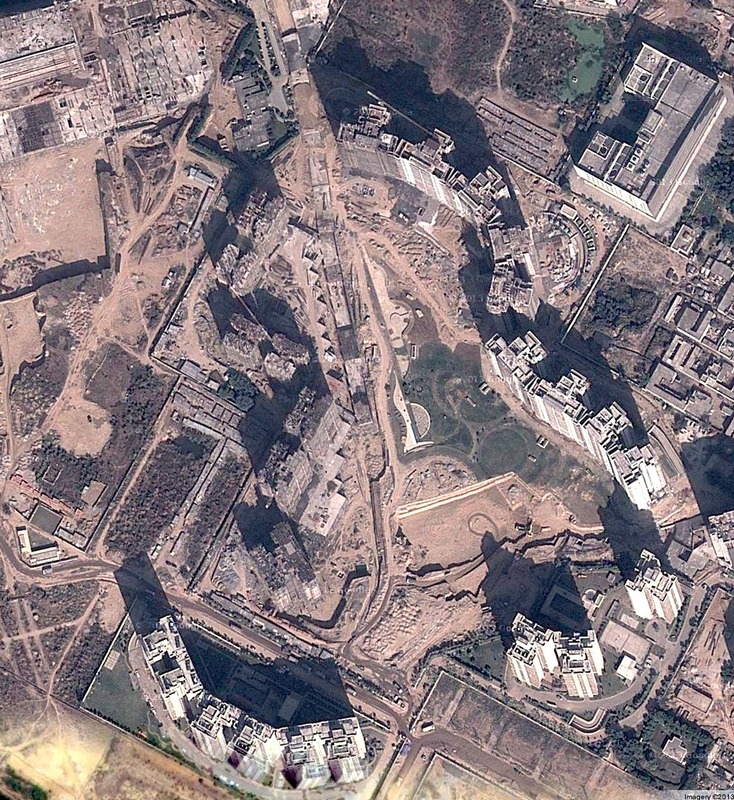 Due to all this construction going on, the incomplete Central Garden has no future. It is neither accessible by existing residents, nor can it be completed. While all these delays continue, residents of Belgravia are now getting together to drag the builder to court. This is in addition to existing cases filed by Bellevue owners. 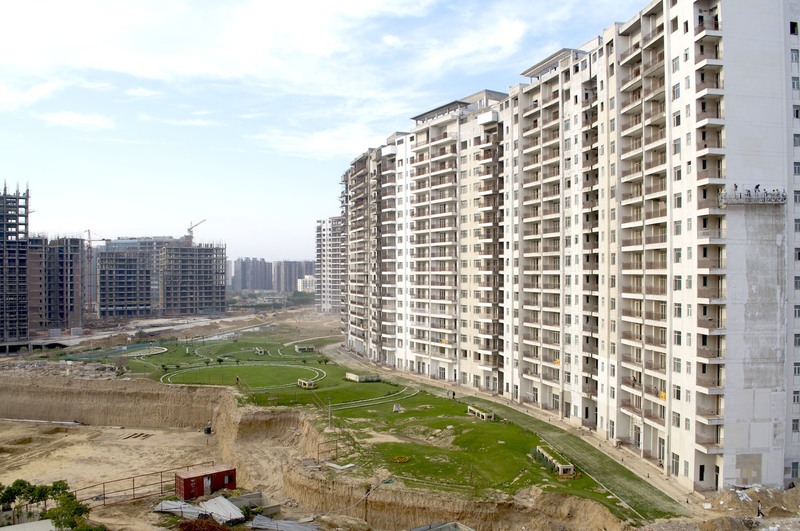 Possession of apartments were offered from Oct 2010 onwards. These are the conditions in which residents are finally living at Central Park II. This is video of the area's that have cement nets and grass in front of Towers. 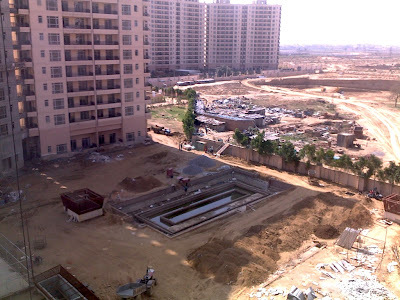 There is absolutely no drainage system in place, how did these buildings in Central Park II Gurgaon get approval for occupancy? Besides the area in front of towers, the entry roads to Tower 1 to 9 also get completely flooded and have already got damaged. Someone seems to have executed the towers without planning for rain water drainage at all. 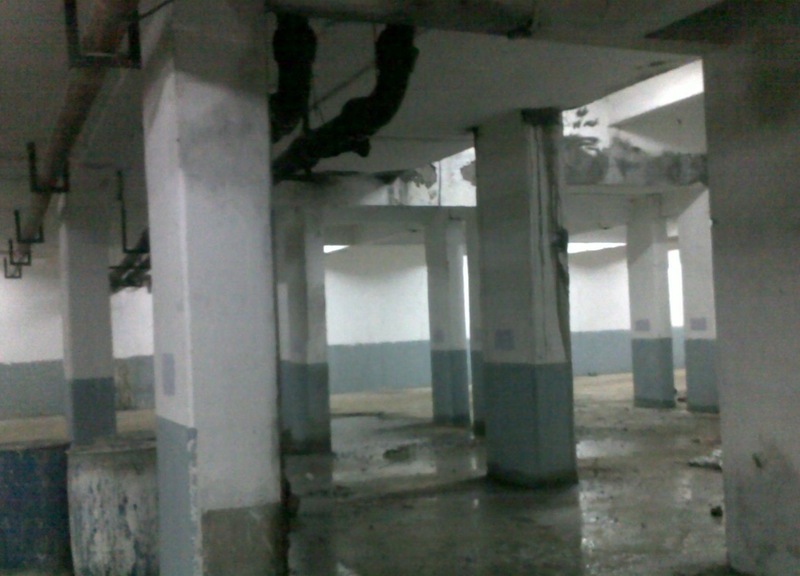 If this wasn't enough, the basements of buildings get completed flooded in Central Park II. Despite all the complaints by residents who are unable to park cars there, no action has been taken to repair these badly constructed buildings. Most of the water pipes in the basement, including the firefighting water supply pipes and drain water pipes leak as if there are big holes in them. The expansion joints between buildings also have been left untreated and water flows through them. Many shafts also pour water into the basements. The builder seems to be passing time so that their one year defect liability period gets over. During this one year, these issues have been highlighted many times but no action has been taken to fix them. Aug 2011 : The work on the Central Garden has started in Central Park 2. 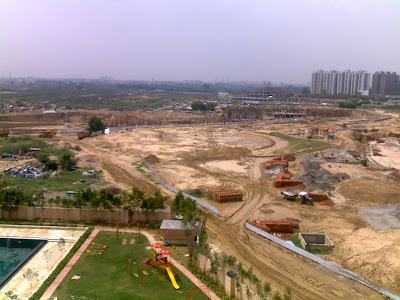 Even before the work started, a controversy has been unleashed, while the builder has always claimed the Central Garden to be 20 Acres, the sanctioned layout plans show the size of the area to be 8.1 Acres. Central Garden in Central Park II - 20 Acres or 8.1 Acres? The development of the garden will take a long time from the looks of it, at least it's begun in right earnest. Meanwhile, construction of towers in 10 - 14 is at it's slowest pace ever. In fact, no progress is visible for the past few months, at this rate there will be a significant delay in finishing these towers and it's unlikely they will be complete in 2012. If you see the progress of towers 15 to 19, that's even more appalling. For some reason, towers 18 and 19 are just not being made at the same pace as other towers. Towers 18 and 19 in Aug 2011. When will they be ready? 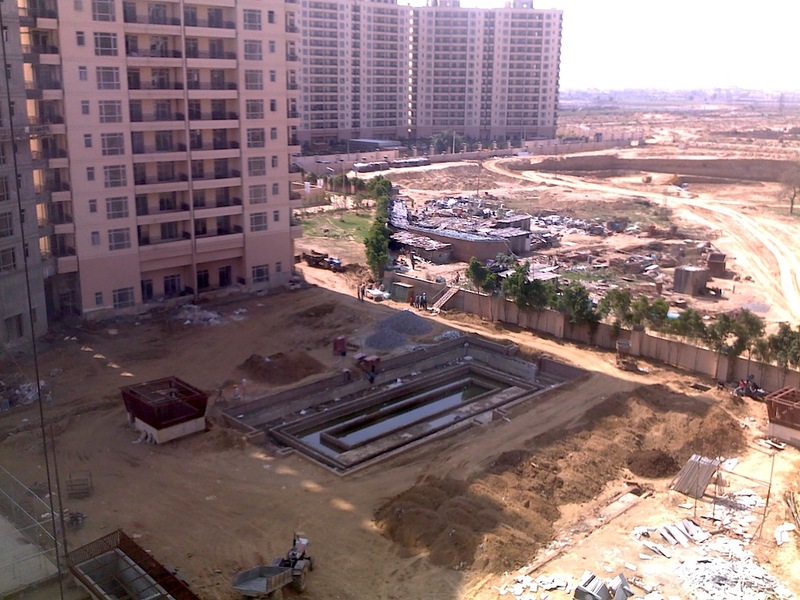 Basement construction work for towers 20 - 22 has just started while excavation till towers 26 is complete. The only thing that's been completed is the Swimming pool in front of tower 7 to 9. 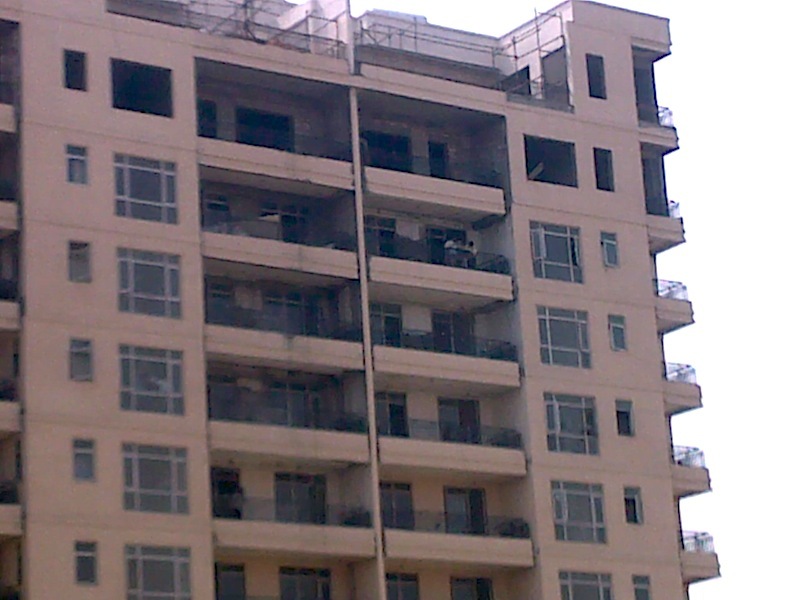 The possession of apartments in towers 8 and 9 is being given and owners are busy sorting out defects and flaws. Swimming pool with kids pool and changing room. Builder has also completed their ambition of completely segregating the residents of tower 1 to 9 by building a wall near the entrance gate, preventing access to Belfort or Belgravia. Of course, this is despite all the protests of the RWA formed by residents. It remains to be seen how this matter is resolved. 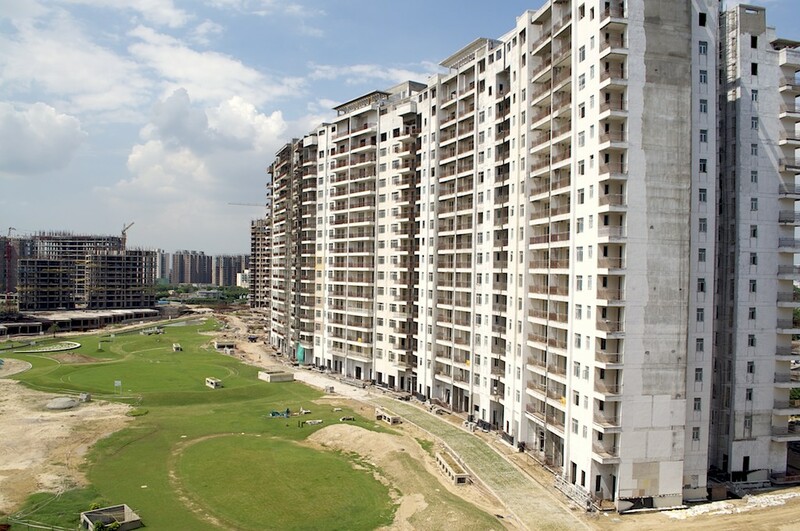 The unending saga of delays continue in the Central Park II project. Please see our previous post here that showed a Belgravia ad with a delivery promise of Dec 2010. This was followed by another ad in Jan 2011 that promised delivery in Dec 2011 which we detailed in this post. It is now July 2011 and Central Park II has further delayed the delivery of Belgravia Apartments. 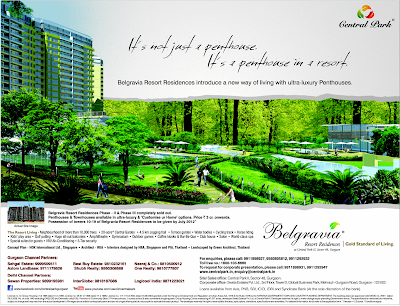 The latest ad, dated 9th July 2011 in the Times of India, Delhi edition promised delivery by July 2012, here it is. No of units 1445 excluding EWS 192 and Domestic Units 150. While the EWS was known from before, what are these 150 domestic units in Central Park II? No one knows. For Towers 1 to 9, all kinds of woes continue. 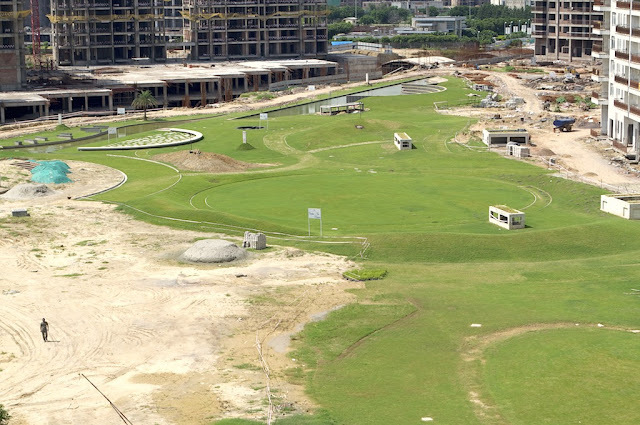 While the work on clubhouse is yet to start, there is no agreement between the builder and the CP2RWA on the size of the clubhouse, facilities etc. Both swimming pools are not useable due to various issues. Most buildings are facing massive water and seepage issues, the lifts of 2 of the buildings have got damaged due to water leakage. Residents live in high floors of the building and are feeling stranded. Tower 8 residents have received their offer of possession, this being the last tower offered for possession in Tower 1 to 9, however finishing work remains from the builders side in towers 7 to 9. Overall, the status of affairs is very dismissal and owners feel not only let down by the builder, they are garnering support to take action against them. 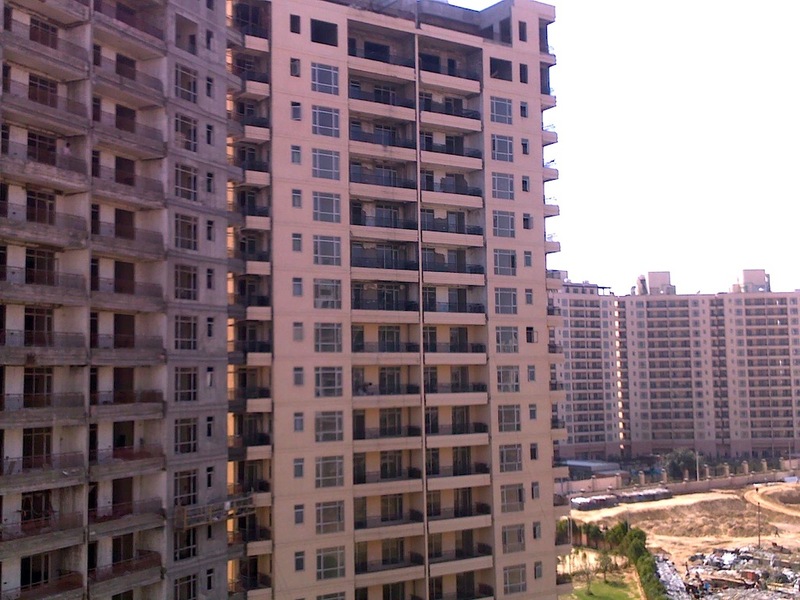 Central Park 2 advertises the project as "The Gold Standard of Living". Do you know why? The builder could AT LEAST have ensured that excavation work of other towers was done before residents were asked to move in. Even now, the excavation is being done for some towers, the 2 central towers are NOT being excavated. 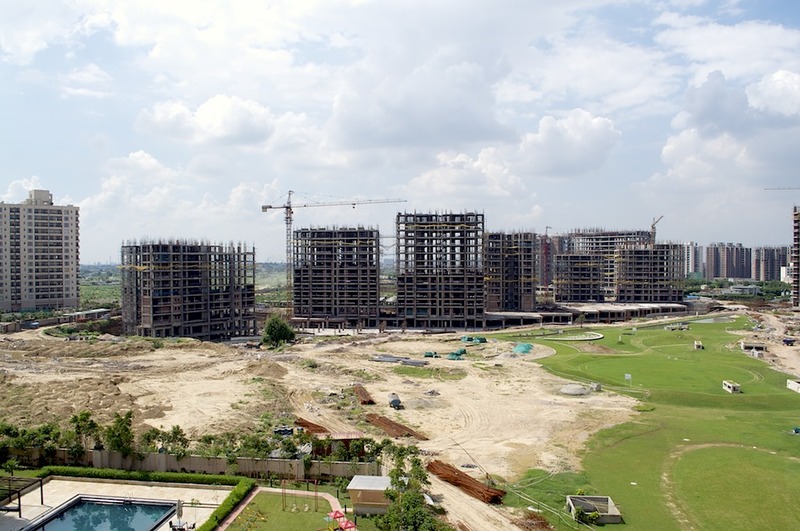 Those two towers will be excavated ONLY after residents of towers 7,8 & 9 move in so that they can also be given the Gold Standard of Living treatment. How does a resident live in such conditions? By the end of the day, the entire apartment is FULL OF DUST. 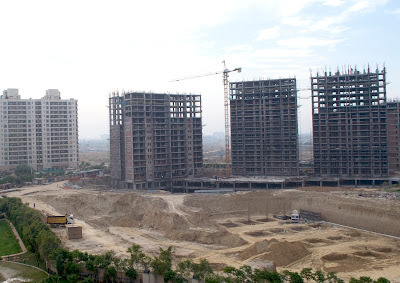 The builder should make attempts to complete the excavation of ALL towers including central 2 towers immediately. 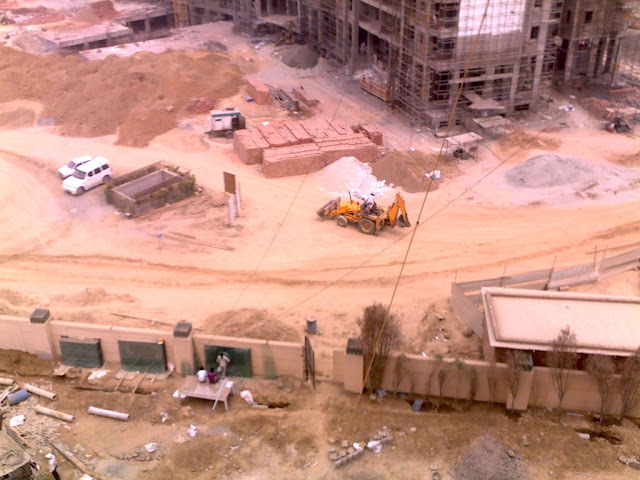 A builder can get away with a lot of things in Gurgaon. 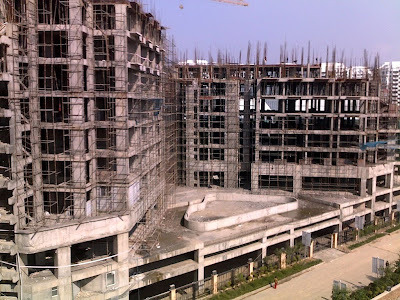 One of them is to offer possession and ask for all payments when the construction is not even over. Central Park 2 has sent letters for offer of possession for towers 7 - 9 asking all owners to take possession and pay their balances. These photos clearly show the towers are months away from being completed. The towers 19 through 26 are just at their early foundation stage. There's a lot of dust in the whole area making it impossible to live in towers 7 - 9 till this work settles down. And for Belgravia owners of towers 10 - 14, the ordeal will continue for a very very long time, you can see the progress (or no progress) here. Pictures were taken on 15th April 2011. Click on photos to see larger version. 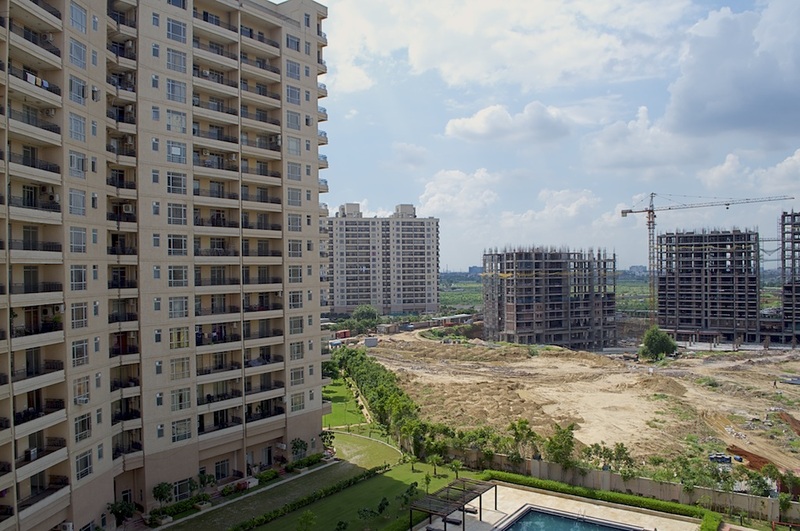 Phase 1 of Central Park 2 was launched on 16 Nov 2004 with the following promise "The approximate time required for handling over the possession of the apartment is 3 years from commencement of construction. The estimated date of commencement of the construction is 30th April 2005"
Please see that towers 7, 8 and 9 are cleverly shown as complete. Let us tell you the truth. It will be several months before these towers are completely ready. Not only this, the builder hasn't delivered promised infrastructure such as Clubhouse, EWS quarters, Creche, Nursery & Primary School etc for Phase 1 of Central Park 2 yet. Even the towers that have been delivered for possession are full of defects and owners are shocked at their pathetic conditions. In such circumstances, owners are left with very little choice but to take further action as necessary. Please do come for the RWA meeting on 27th March 2011. The hyper-delayed project Central Park 2 continues to crawl at an extremely slow pace. Expect further reduction in speed as Holi approches this month and a lot of their labor force will vanish for a few months. Not only this, the prices of properties in the project have also stalled and started showing a down-ward trend with word getting out that the builder has compromised on promises, quality and features. Tower 10 - Which was promised for delivery in Dec 2010 with interiors matching that of sample apartment. Owners will be lucky if they get possession somewhere in 2013. 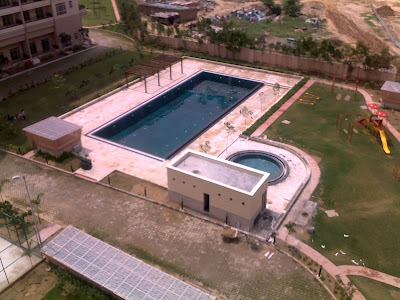 The beautiful 20 Acre Central Garden for which Crores worth of PLC has been charged. It is now becoming evident that the Garden is not even 9 acres. 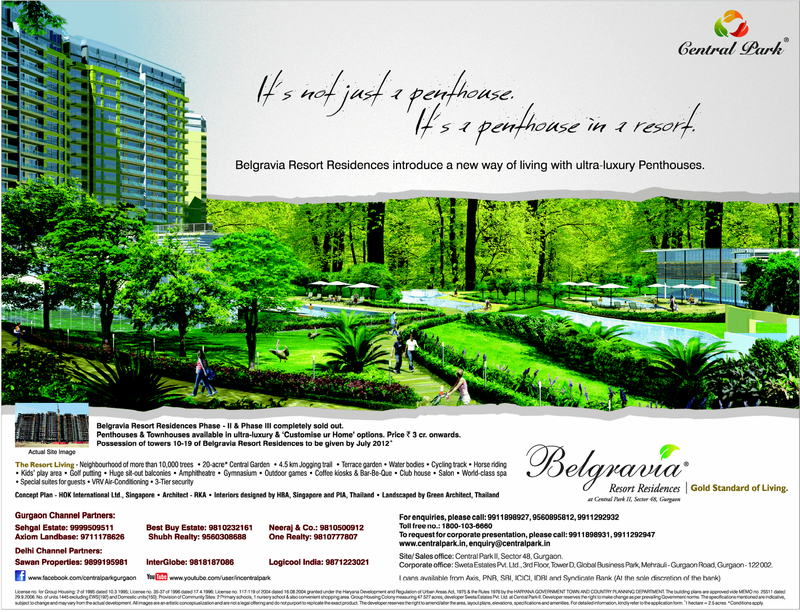 If you believe it is 20 acres, try to get a written statement from the builder that the central garden will be exactly 20 acres as promised. 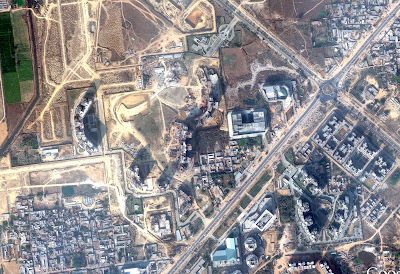 Tower 7 that was promised for delivery in Oct 2010, then Dec 2010 as final, than Jan 2011, then Feb 11... half the buildings interiors are not complete. Notice Tower 8 next to it? Tower 8 is a mystery no one is able to solve. From rumors of structural defect including bulging on walls to contractors running away for non payment, we've heard it all. 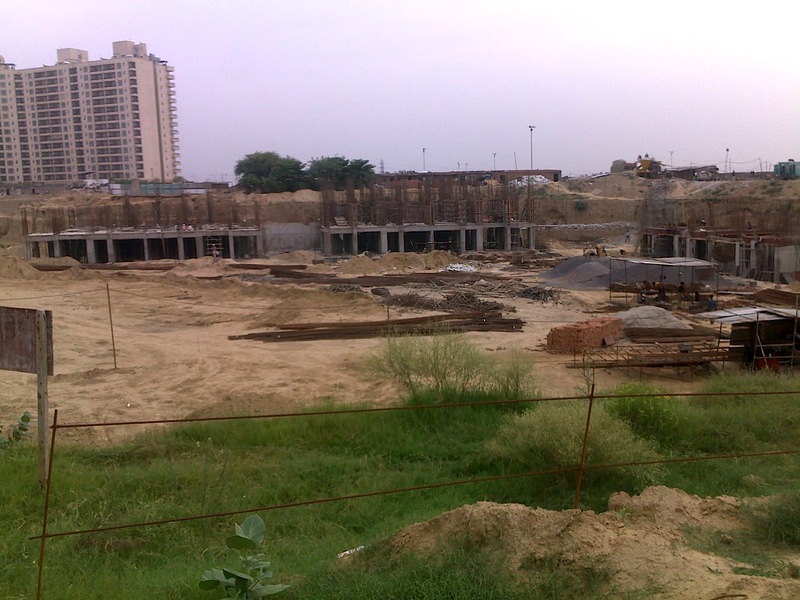 Fact is, there's no progress so far and it's unlikely to be ready before July - Aug 2011. 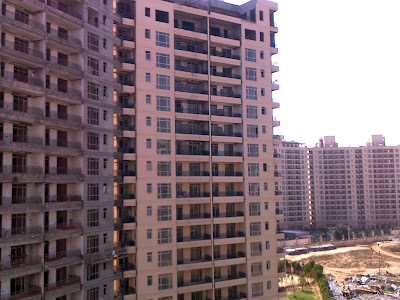 After 5 years of construction, 2 more floors have been added to Belfort towers in the past couple of months. Can't predict when they'll be ready. 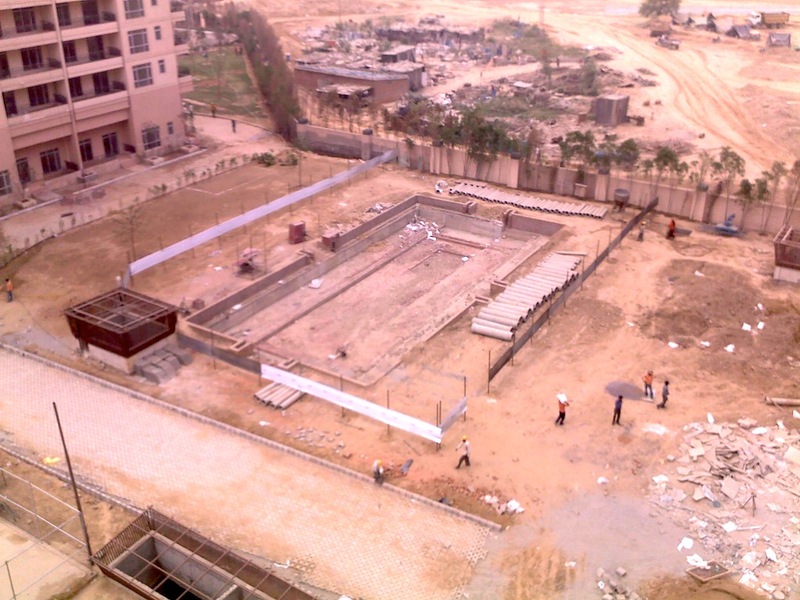 The swimming pool around towers 7,8 and 9 - no construction work on this yet. How will residents of these towers live in them with a dangerous, incomplete structure in between? As you can see, the project is far from reality. 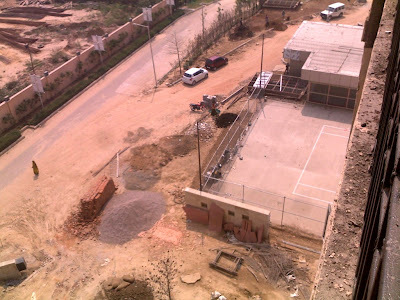 The construction mess is all around the site, there's no sign of a central vista or garden for which PLC was charged from all the front facing apartments. The primary school, nursery school, creche and clubhouse for towers 1 to 9 have not yet been built as promised in 2004-2005 till date. Towers 15 to 29 are also significantly delayed while the structure for towers 10 to 14 seems to be up. Around towers 7 to 9, lot of construction work is going on - these towers are not even handed over to owners. The two Belfort towers near the entrance are also still under construction. 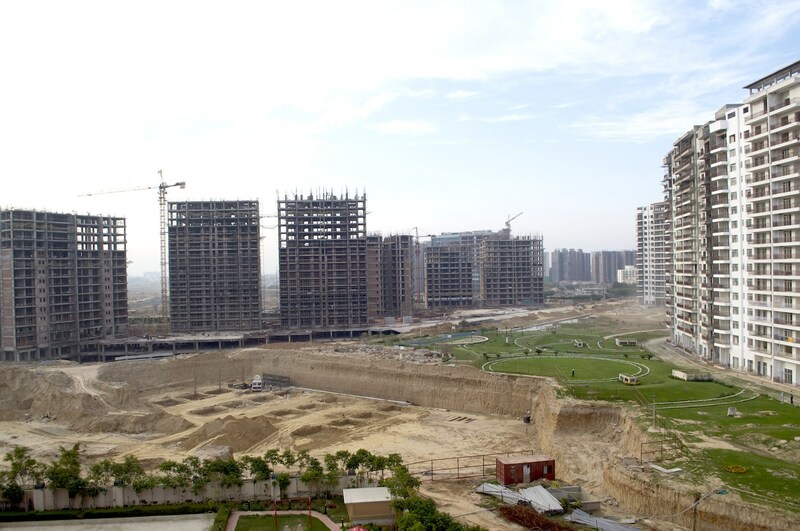 In the 5 years between 2005 and 2010, CP2 has managed to construct only 6 towers. These 6 towers are full of defects. Walls have seepage in them, tiles are of extremely poor and 3rd grade quality, electrical wiring is not properly done (some place, the conduit pipes are missing), underground parking is not yet ready, swimming pools had leaking issues and had to be emptied out within 10 days of water being filled, promised water bodies around towers 1 to 6 that were created were also leaking and had to be shut ..the list goes on. People are now asking when rest of towers will be completed - I'm sure God will have a difficulty in predicting that too. 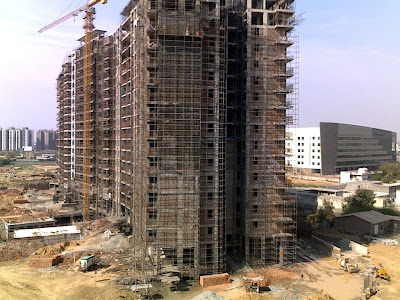 If you see the archives of this blog from March 2009, every prediction made so far has failed on completion of towers. 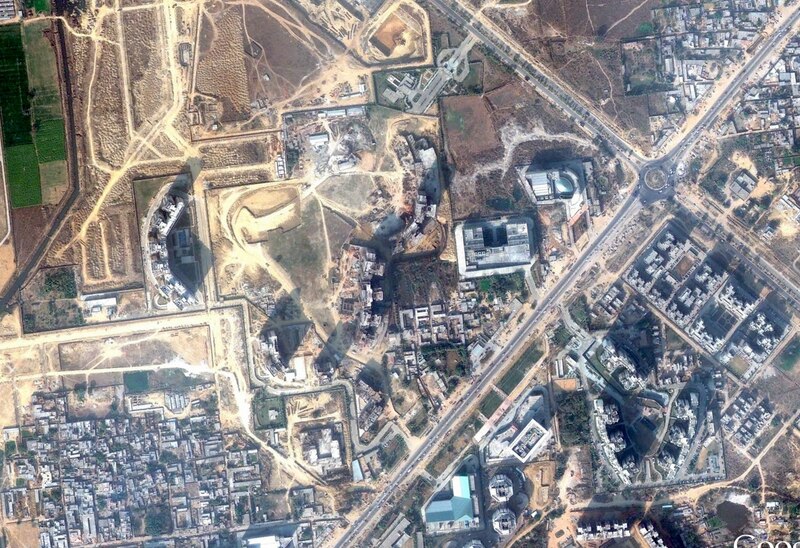 Look at the picture further, on the right is Uniworld Garden. The sale of this started in 2005, around the same year as CP2. 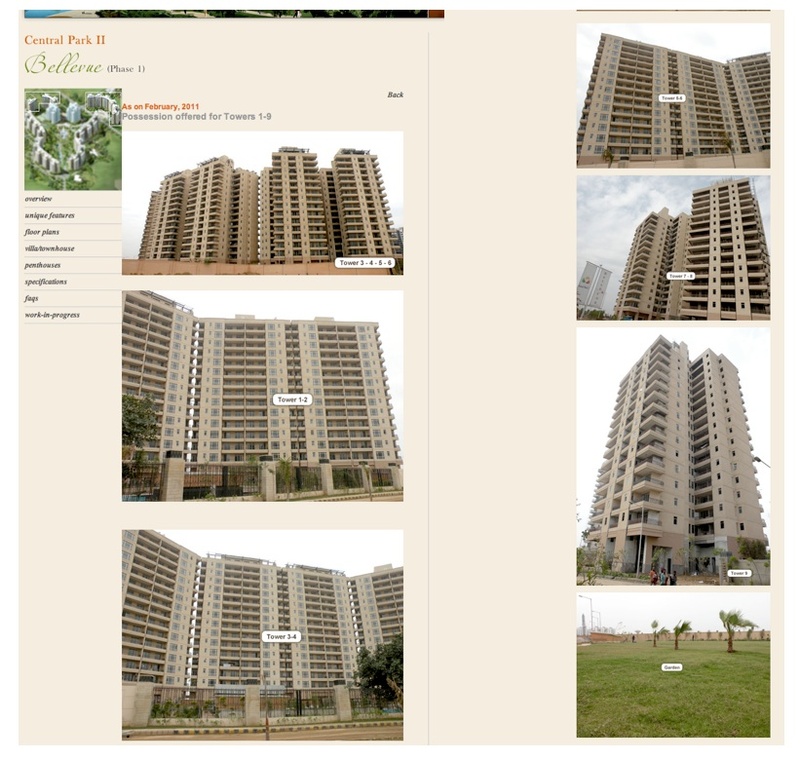 People have been living in the completed project from 2009 onwards and the prices are about Rs. 1000 per sq ft higher than CP2. 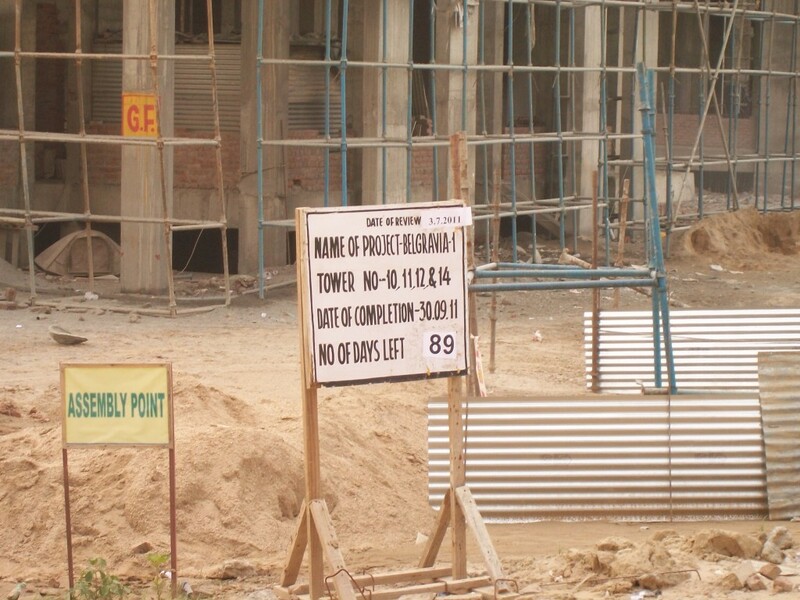 It is strange that even in a messed up project like this, people are buying apartments. I don't know what attracts them, maybe it's the low prices compared to nearby properties. Or maybe they don't get to meet some owners of apartments in CP2 so they aren't making informed decisions.